Given the empirical evidence of the effect of financial literacy on a number of debt-related financial behaviors, such as e.g., mortgage-related decisions and use of credit cards, the construct of financial literacy is defined (including both level of objective knowledge and individuals’ own perception of level of knowledge) and discussed, both in general and connected to borrowing decisions. Together with age, gender, education, and income, the impact of financial literacy on a number of variables (including choice of variable or fixed mortgage rates, use of credit cards and use of pawn shops) is assessed and discussed. 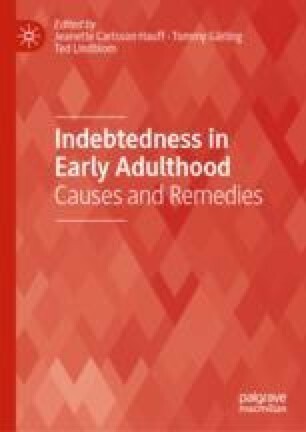 The connection between literacy and indebtedness for the group of young adults is also specifically addressed. Carlsson Hauff, J., Carlander, A., Gärling, T., & Nicolini, G. (2018). Stages of retirement financial behavior related to a new survey measure of financial literacy (CFF Working Paper). Available at https://cff.handels.gu.se/digitalAssets/1681/1681821_financial-literacy–working-paper-cff-2018-new.pdf. Harrow, R. (2017, February 3). Discover’s daring bid for credit-card revolvers. Forbes. Available at https://www.forbes.com/sites/robertharrow/2017/02/03/discovers-daring-bid-for-credit-card-revolvers/#331ef77e588a. Klapper, L., Lusardi, A., & van Oudheusden, P. (2015). Financial literacy around the world: Insights from the Standard & Poor’s ratings services global financial literacy survey. Global Financial Literacy Excellence Center (GFLEC) at the George Washington University School of Business. Available at http://gflec.org/initiatives/sp-global-finlit-survey/. PACFL. (2008). Presidents Advisory Counsil on Financial Literacy (Annual Report to the President). Available at https://www.treasury.gov/about/organizational-structure/offices/domestic-finance/documents/exec_sum.pdf. Riksbank. (2018). Payment statistics. Available at https://www.riksbank.se/en-gb/statistics/payments-notes-and-coins/payment-statistics/.